The first Icinga meetup in Salzburg, Austria happens on Oct 12th, 2018 – join for more #icingalove. The Berlin meetup was a great success, Carsten and Lennart joined there too. Watch their meetup group for future dates. 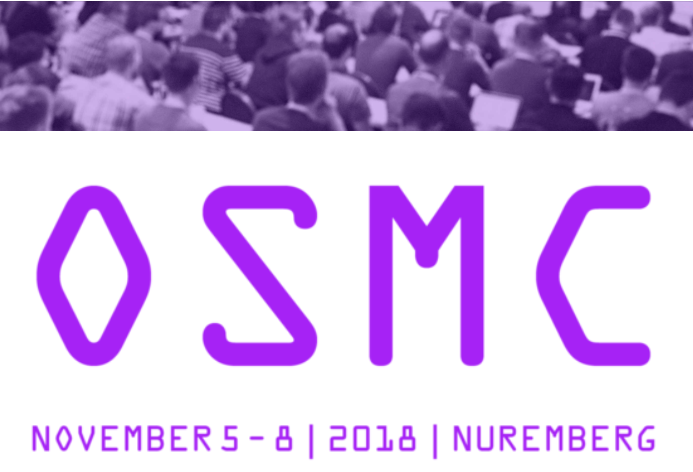 The OSMC 2018 schedule is online, with so many interesting talks in two days on three tracks. The hackathon on the last day is also back for more #icingalove. Watch out for future Icinga trainings by our partners. There’s a new workshop available by NETWAYS which practices automated setups with Puppet and Icinga. This month brought many releases: Icinga Web 2.6.1 as bugfix release, Graphite module 1.1 and Director 1.5. 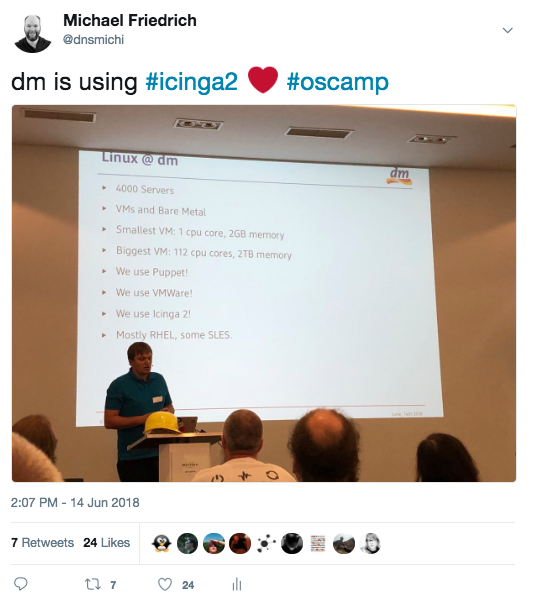 Icinga joined the OpenAPM initiative in August, you can learn more about it at OSMC later this year. We’ve also learned that Icinga is now an official input for InfluxDB’s Telegraf. Carsten released v1.3.0 of the Grafana module for Icinga Web 2. Claudio shared insights into pinning checks in HA enabled cluster zones. Our partner NETWAYS has uploaded their webinar on building an Icinga 2 environment. 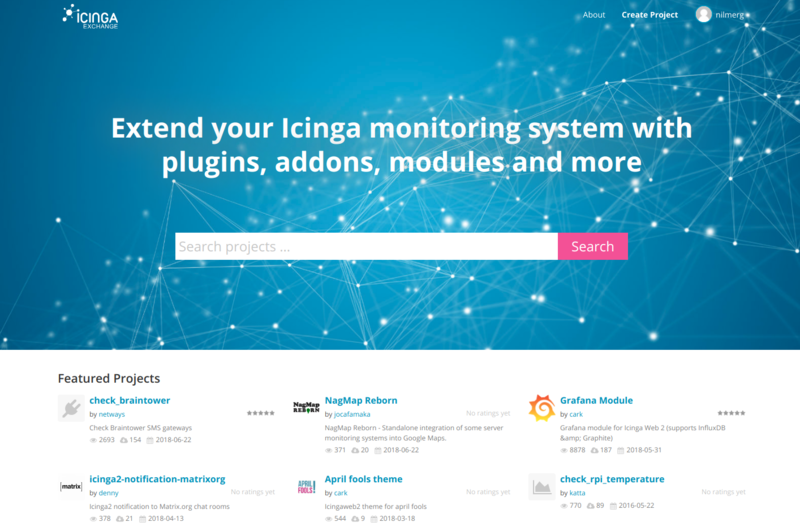 Bernd updated his blog post series on monitoring tools which includes Icinga (obviously ^_^). When the Icinga 2 book v2.0 got released, you are doing crazy things …. you’ll pause your vacation and drive 140 km … or you’ll wait and take it with you … sit at home and wait like xmas … compare the size, it is huge … feel motivated in a new week … and just love it. 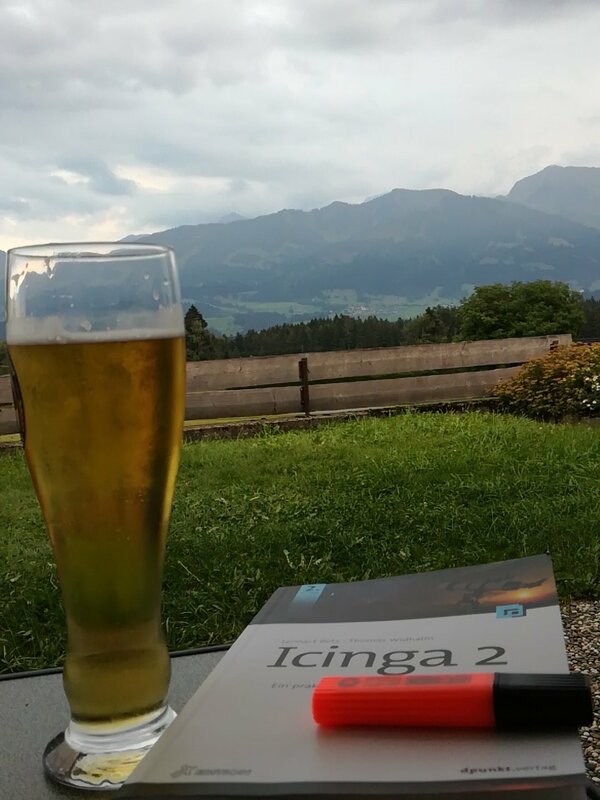 Thank you Sascha for the nice view with the Icinga 2 book! July brought you new releases for our monitoring core and web frameworks: Icinga 2.9 and Icinga Web 2.6. Both major versions add more awesome features to your monitoring stack. Icinga 2.9.1 was already pushed fixing a problem with non-Systemd platforms, Icinga Web 2.6.1 is coming later this week fixing a regression. On the other hand, integrations and cool new ideas are floating in our community channels. 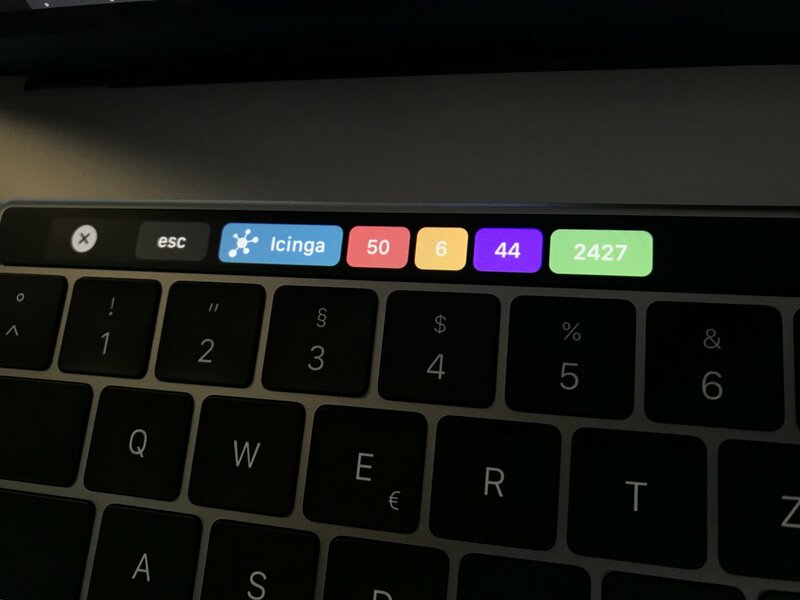 My personal highlight this time: A Macbook Pro touchbar status from Icinga, true #monitoringlove shared by noledge. This month we’d like to welcome our newest Icinga partner: T1 Solutions. The Icinga-as-a-Service NWS platform hosted by our partner NETWAYS now features Icinga 2.9 master and satellites, try it out! Our partner Axxeo shared their insights on deploying Icinga 2 configuration with Ansible (German blog post). We are planing with more events and camps in 2018/2019. Please let us know if you are interested in joining us in Washington, D.C., Tel Aviv, Berlin or Stockholm. This month we’ve been working hard on resolving the remaining issues for Icinga 2.9. The release will happen soon, now we gladly receive your test feedback from the snapshot packages. Bullet points are Elasticsearch 6 support, minimum version in the “icinga” check, fixes for the Windows reload, memory problems, scheduled downtimes and notification order. Meanwhile, developers are also taking care of Icinga Web 2.6 coming this summer. You can expect new features like audit logging and new group grids, better monitoring health indicators and PHP 7.2 support. There’s also work underway for the business process module, sponsored by a customer. OSMC 2018 Call for Papers is officially open and we are looking forward to hear your Icinga stories this year. Did you dive through distributed setups, automated everything and combined the metrics of many tools into your stack? That’s a hell of a ride, and other community members will certainly listen and learn from your expertise 🙂 Did you hack your own modules, themes and addons and want to share it with more than 250 other monitoring enthusiasts – write an abstract, choose a fancy title, hit “Submit” and see you in Nuremberg from November 5th to 8th, 2018. The first Icinga meetup in Berlin was pretty much a blast, and community members enjoyed it a lot. Let’s hope to see more meetups in the future – if you need help with promotion or swag, just let us know.